The Battle of Britain was an important battle in World War II. After Germany and Hitler had conquered most of Europe, including France, the only major country left to fight them was Great Britain. Germany wanted to invade Great Britain, but first they needed to destroy Great Britain's Royal Air Force. The Battle of Britain was when Germany bombed Great Britain in order to try and destroy their air force and prepare for invasion. The Battle of Britain started on July 10th, 1940. It lasted many months as the Germans continued to bomb Britain. The name comes from a speech by the Prime Minister of Great Britain, Winston Churchill. After Germany had overrun France, he said that "the Battle of France is over. The Battle of Britain is about to begin." Germany needed to prepare for the invasion of Britain, so they first attacked towns and army defenses on the southern coast. However, they soon found that Britain's Royal Air Force was a formidable opponent. The Germans decided to focus their efforts on defeating the Royal Air Force. This meant they bombed airport runways and British radar. Although the German bombings continued, the British did not stop fighting back. Hitler began to get frustrated at how long it was taking to defeat Great Britain. He soon switched tactics and started bombing large cities including London. On September 15, 1940 Germany launched a large bombing attack on the city of London. They felt that they were closing in on victory. 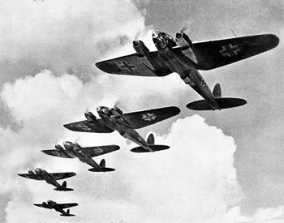 The British Royal Air force took to the sky and scattered the German bombers. They shot down a number of German planes. It was clear from this battle that Britain was not defeated and that Germany was not being successful. Although Germany would continue bombing London and other targets in Great Britain for a long time, the raids began to slow as they realized they could not defeat the Royal Air Force. Although the Germans had more planes and pilots, the British were able to fight them off and win the battle. This was because they had the advantage of fighting over their own territory, they were defending their homeland, and they had radar. Radar allowed the British to know when and where German planes were coming to attack. This gave them time to get their own planes in the air to help defend. Great Britain's air force was called the RAF or the Royal Air Force. Germany's air force was called the Luftwaffe. The code name for Hitler's invasion plans was Operation Sea Lion. It is estimated that around 1,000 British planes were shot down during the battle, while over 1,800 German planes were destroyed. The main types of fighter planes used in the battle were the Messerschmitt Bf109 and the Bf110 by the German Luftwaffe and Hurricane Mk and Spitfire Mk by the Royal Air Force. The leader of the German Luftwaffe was Herman Goering. The leader of the Royal Air Force was Sir Hugh Dowding. Germany continued to bomb London at night until May of 1941. This series of bombings was called the Blitz. At one point London was bombed for 57 nights in a row. Hitler finally stopped bombing London because he needed his bombers to invade Russia.